What the hell do these names have to do with football? And what sort of brand value comes from simply slapping your name on an event? Only a few game sponsorships make sense, like Tostitos Fiesta Bowl and Bell Helicopter Armed Forces Bowl. Anyone can see the relationships there. Who cares if there’s a relationship? Well, that relationship makes the brand easier to remember. And isn’t that the point? These brands could all learn from Mountain Dew. A while ago, I heard Mountain Dew was coming out with new flavors again—something that hasn’t gone too well for them in the past. This time, they let Dew-drinking fans decide. And the new one, as they say, “chosen for the people, by the people,” was White Out. A week ago, I tuned in to the Winter Dew Tour on NBC. The snowboard halfpipe competition was airing live from Breckenridge, Colorado. I could barely tell which snowboarders were in the pipe because of the heavy snow falling. It was a literal white out. The camera zoomed in to the starting area and there it was, the most perfect brand placement ever. A barrel cooler of Mountain Dew White Out…in white out conditions. What a way to promote the product! Dew definitely knows its target audience. Other brands should be more like Dew and put more thought behind choosing events that make the most sense. Yes, sometimes the decision might be based on the amount of reach and visibility. And that’s ok, as long as the audience the event is most visible to is your target audience. As for the college bowls, brands would get more bang for their buck if they sponsored events that made sense. Like instead of Allstate, maybe UPS could sponsor the Sugar Bowl and name it the Brown Sugar Bowl. Well, I was going to say Domino, but it’s kind of not their target audience. And hey, how much fun could UPS have with that? Maybe someone can forward this blog to them?? Or, do you have any better ideas? Many companies and organizations start based on a very simple idea: Someone sees a need and decides to fill it. In 1947, Toys for Tots started in this same way. Diane Hendricks made a doll and asked her husband, Major Bill Hendricks of the U.S. Marine Corps Reserves, to give the doll to an organization that would give it to a needy child at Christmas. 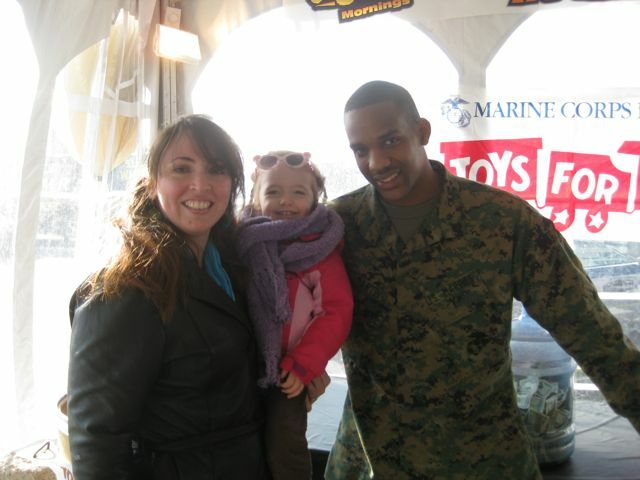 If you’re not familiar with Toys for Tots, it’s one of the easiest ways to help needy kids smile. Each year, more and more places become toy drop-off locations. You’ll see drop-off boxes in stores, in doctors’ offices, in office buildings and even at other charity events. You can spend as much or as little as you want. Buy a football or board game. Buy a doll or a toy truck. Toys“R”Us usually has Toys for Tots drop boxes, so you can add one more toy to your cart and drop it off on your way out the door. You don’t even wrap it. The Marines have kept this donation program going for 63 years—44 years without an official foundation to support their national efforts. Pretty darn impressive—but then, would we expect anything less from Marines? I love kids, and this is such an easy way to donate that I give every year. Another reason I give, though, is because of the Marines. I figure, if these men and women can find time to help even in times of war, then I have no excuse not to give. Make it easy for your customers to take action. Maintain a strong, honorable brand. But today’s blog isn’t really about marketing. I just thought I’d take this holiday time to focus on a real story of giving. Happy Holidays everyone! Enjoy the time with the ones you love. Let’s keep the spirit of giving going, every month of each year. Can’t afford to give this yea? Try these free ways to help others: Fight hunger and learn new words at the same time at Free Rice. Click to help the cause of your choice at the Hunger Site. Last week, I talked about how Logitech missed the mark with their Kevin Bacon ad. This week, I want to show you a company that does it right—Intuit. Is it as entertaining as the Kevin Bacon commercial? No. But, do you walk away knowing what you’ll get from Intuit? Yes. And that’s what’s important. Intuit’s products and services make you feel like you have a back room full of business experts ready to help you. That’s the message the audience gets. Small businesses rely on innovation and flexibility to thrive. Intuit proves—with their advertising and their product development—that they know their audience. The problem is the ad is a waste of money. The buzz created isn’t about Logitech, it’s about Kevin Bacon. And who really knows what the commercial was for? Ok, sure, it’s for some keyboard doohickey that lets you use Google TV. Well, what does that mean? They spent so much time on the funny Kevin Bacon part that they left too little time to explain what their product does. Assuming that we already know is a risky move. Did Logitech create the ad only for the narrow audience that understands Google TV? Or did they think being funny was enough to drive people to buy their product? Either way, that’s bad advertising. And, if Verizon isn’t quite up to speed now, won’t they be soon? Given Verizon’s competitive abilities, I think that’s the safe bet. Why would I buy Logitech’s keyboard? Kevin Bacon gave us reasons to laugh. Too bad Logitech didn’t give us a reason to buy. If you want to know more about Google TV, check out Gizmodo’s site. They did a good job of explaining it.